The ABFM’s PRIME Support and Alignment Network (SAN) is part of the federal, Transforming Clinical Practice Initiative (TCPI) led by the Centers for Medicare & Medicaid Services. This initiative was designed to provide clinicians free technical assistance to build the comprehensive quality improvement strategies and “practice transformation” needed to survive and thrive in a value-based reimbursement environment. Through enrollment in one of twenty-nine Practice Transformation Networks (PTNs)* or one of two hybrid Support and Alignment Network (SAN) 2.0s and assistance from nine additional SANs, clinicians join the extensive nationwide, collaborative CMS Quality network. 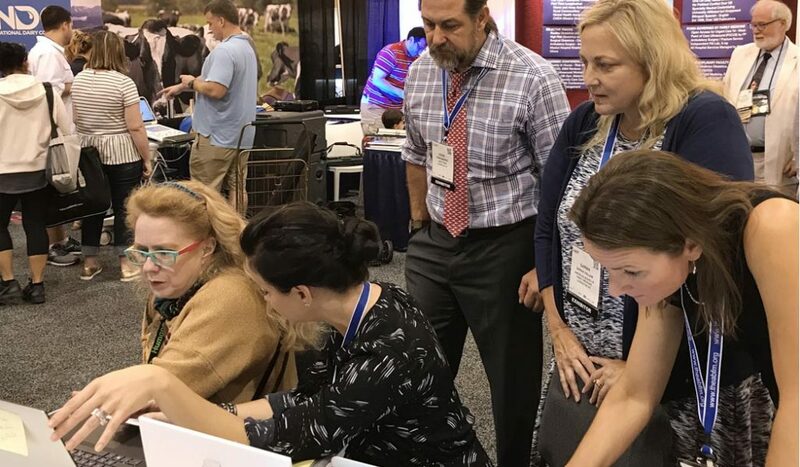 The The ABFM created the PRIME SAN to help support and align Family Physicians’ professional activities with their practice improvement efforts by offering Performance Improvement activity credit for PTN participation and the PRIME Qualified Clinical Data Registry free for three years. Scroll down for details on each offer! 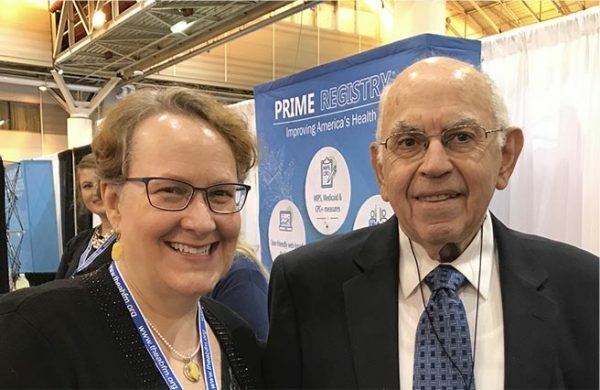 ABFM PRIME SAN Program Manager, Dr. Elizabeth Bishop with ABFM Senior Advisor to the President, Dr. Joseph W. Tollison at FMX 2018. ABFM board-certified Family Physicians who are enrolled in a TCPI-supported PTN, may apply for 20 Family Medicine Continuing Certification/Performance Improvement activity points by completing a questionnaire on their PTN-related Performance Improvement activities–no uploading of quality measures necessary! To complete this questionnaire, log in to your ABFM Physician Portfolio, click on “PTN Participation” located under the “Spotlight Programs” section on the left hand side of the screen, and follow the prompt to START the attestation process. *Note that Family Medicine residents are able to receive 20 Family Medicine Certification points for completion of this activity, however, this will not fulfill the “minimum of one (1) Performance Improvement Activity with patient population.” The 20 points will, however, help Residents reach their minimum 50 points requirement. Create your own PDSA cycle quality improvement intervention using PRIME Registry or other data for tracking your improvement. Complete one of these three activities—hosted on the University of Colorado’s e-Learning platform—for 20 ABFM PI activity credit points. Successful completion of one of these modules will satisfy ABFM requirements for board-certified Family Physicians’ Continuing Certification/Performance Improvement activity points, for Family Medicine residents’ requirement of Performance Improvement Activity with patient population, and may be submitted for potential credit from other specialties (check with your certifying board for more information). One of the TCPI primary drivers of practice transformation is continuous, data-driven quality improvement. To assist with this effort, we’re offering the ABFM PRIME Qualified Clinical Data Registry free for 3 years to all ABFM board-certified family physicians who sign up. The PRIME Registry is open to all primary care providers (including NPs and PAs) and includes a robust set of clinical quality measures calculated and displayed in the secure, web browser-based PRIME Registry dashboard–for tracking and identifying areas for care improvement. PRIME also includes new features like the PHATE™ Population Health Assessment Engine tool. Clinicians may also authorize PRIME to report approved measures for two Medicare Quality Payment Program tracks: the Merit-based Incentive Payment System (MIPS) and the Advanced Alternative Payment Model, Comprehensive Primary Care Plus (CPC +). PRIME Registry team demonstrating the quality improvement dashboard to Dr. Patricia Fitzgibbons at FMX 2018. *Note: Your practice is not eligible to enroll in a PTN if you currently participate in any of the following: Medicare Shared Savings Program (MSSP), Pioneer Accountable Care Organizations (ACOs) including the Next Generation ACO model, the CMS Comprehensive Primary Care Initiative (CPCI), or the CMS Multi-Payer Advanced Primary Care Practice (MAPCP) ACOs. You may, however, join a PTN if you are part of a Medicaid or private payer ACO program. The project described was supported by Funding Opportunity Number CMS-1L1-15-002 from the U.S. Department of Health & Human Services, Centers for Medicare & Medicaid Services. The contents provided are solely the responsibility of the authors and do not necessarily represent the official views of HHS or any of its agencies. Are you a PRIME user? Contact you to follow up?